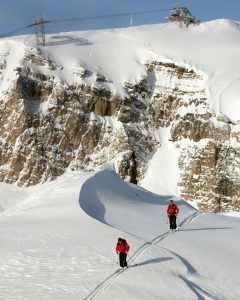 There were five of us traversing Ten Sleep Bowl at Jackson Hole in extreme flat light conditions. It’s a wide open expanse with nothing to use for reference points so we were going single file. We stopped to regather and then Ken Hildick said he’d take the lead. He started out and just disappeared! We slowly moved forward to find about a six foot cornice with Ken looking back up at us from the snow below. We all have our favorite flat light stories or maybe I should say flat light horror stories. I remember Ken saying later, “you know that could have been fifty feet!” And he was right, flat light in unfamiliar terrain can be dangerous. Flat light occurs when it’s snowing, when you’re skiing in fog or a cloud, when it’s overcast, or as George Feneis commented on my blog, anytime you ski at Stratton! Flat light can make it difficult to tell up from down or see bumps that are literally under your skis. Often you can’t tell how fast you’re going including whether you’re stopped or not. Quite a few times in those conditions I’ve thought I had come to a stop, but was surprised to find I was still moving. It’s easy to get vertigo under these circumstances. So what causes flat light? We know that it occurs when there’s no direct light source, but it must be more complicated than that? Blue light is the culprit. The human eye breaks down the light it sees into three components: red, green, and blue. TVs traditionally followed this same model representing colors in RGB values. Blue light predominates in low light situations and it scatters easily, reflecting off everything equally so what we see all looks the same. If only we could get rid of the blue light, maybe we could see better in flat light situations. And that’s the theory behind ski goggle lenses. First we need to understand more about the way we perceive color. When we look at a red ball, we see the light reflected off that ball. Since it’s a red surface it only reflects red light and absorbs green and blue light. So if we could come up with a lens that could absorb blue light, but let red and green through, we might have something. What color do we get if we combine red and green? That’s right, it’s yellow! And that’s the reason most goggle lenses for flat light are yellow or orange. 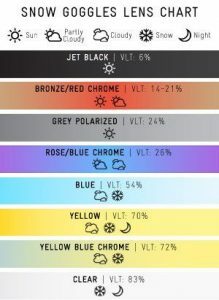 I did receive a couple of answers from R. Rafael and George Feneis that correctly said yellow lenses provide better contrast on flat light days. Next time you find yourself in flat light conditions take a moment to compare your vision with and without your goggles. Can you see the difference? I did this recently and could see a difference although I have to admit visibility still wasn’t good. By the way, blue light is getting a lot of blame lately for more than flat light. It appears that our increased reliance on electronic media has increased the amount of blue light we’re exposed to and blue light can hasten macular degeneration. So there’s a market for glasses that can reduce the blue light and guess what color they are? Yup, they are orange! Other than goggles what other tricks are there to deal with flat light? Trees are your friends! It’s amazing how some objects provide definition. And you don’t have to ski in the trees. Just skiing close to the edge of a trail can provide the definition you crave. When I was hosting I often coached people on flat light days to ski next to the trail edge. I would lead the way and while they always said they could see better, they’d go right back out to the middle of the trail! 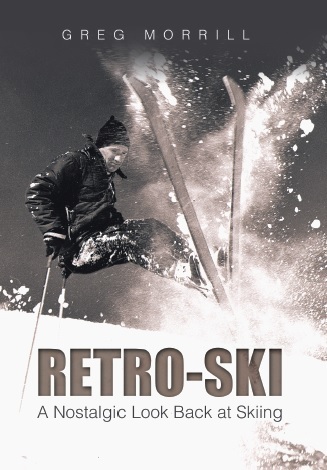 I have bad news for RetroSkiers. As we age our vision degrades and this especially affects snow contrast sensitivity. Jon Weisberg, co-founder of SeniorsSkiing.com, wrote an article a few years back which highlighted cataracts as the primary cause of this. Cataracts become more common as we reach our 60s and 70s. Even having them treated doesn’t guarantee a return to our youthful vision. Macular degeneration and glaucoma also become more common although they affect the brain’s processing of the information more than direct vision. However we RetroSkiers generally have one more way to handle flat light, we can just go home and ski another day – the famous “one and done” approach!